I love love love dumplings and dim sum. I can honestly say that I haven't met a dumpling I didn't like, and that includes non-Asian versions, like Armenian manti and Polish pierogies. There is a world of dumplings out there, and my life goal is to eat my way through it (not a bad goal, huh? hehe). 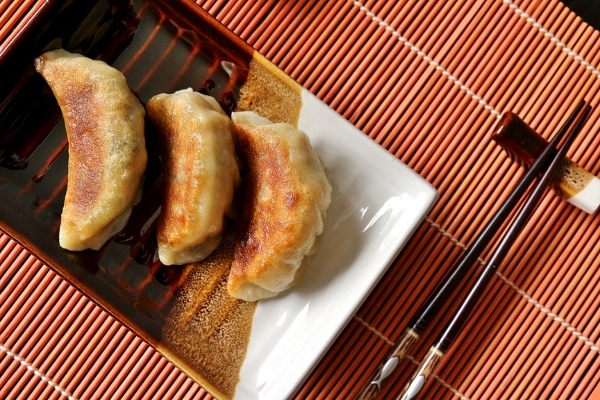 Most people use store-bought dumpling, wonton, and spring rolls skins to make Asian dumpling creations in their home kitchens. It's a wonderful convenience that saves a lot of time. I am an elitist, however, and enjoy the flavor and texture of homemade skins so much that I will go out of my way whenever possible to make them myself. It makes a world of difference and I highly suggest that you try it at least once. Much like fresh pasta versus dried, the texture of the homemade skins is exponentially better than their dry counterparts, which require water or egg to seal and never yield that toothsome, slightly chewy texture that one finds in dumpling houses. In the end, it's just not the same. Another thing I really love about dumplings, and dim sum in particular, is the variety you can achieve in one meal. Going to a dim sum house gives you an incredible selection of foods, especially when dining with a larger party because you can order even more plates to try! At home, it is a lot easier to stick to just one recipe, as making the dough and filling, and then assembling and cooking it can take significant time depending on how much you want to challenge yourself. I apparently like to challenge myself a lot. In my first attempt to make dim sum, I made 4 different recipes! This time, I stuck with just 3, but it still took a great part of the day and required some advance work. I made char siu (Chinese BBQ pork) from scratch a couple days before. It made enough to make 4 different recipes (depending on what you are making) and I froze some of the extras for future use. On the day of my dumpling adventures, I used some of the pork to make a char siu filling for baked bao (buns), which utilize a yeasted dough for their wrappers. I made the dough too, of course, and assembled and baked these off. 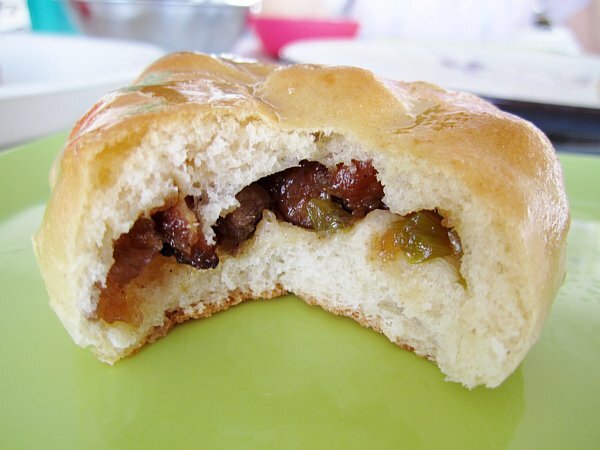 The dough was fluffy and slightly sweet with a savory-sweet pork filling inside. 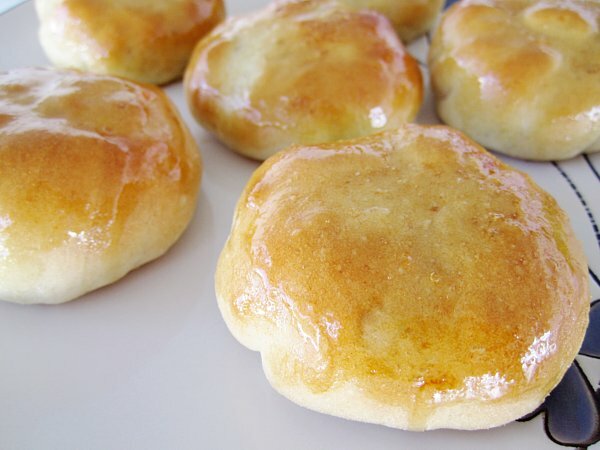 I love the honey glaze brushed on top for extra shine and flavor. I made medium-size buns, and froze half of them for future use. The other recipe I made from her book, and the one I've chosen to share with you today, is for vegetable dumplings. In the book this recipe includes instructions for steaming the dumplings, but any of the fillings in the first chapter can be swapped for the different cooking techniques (boiling, pan-frying, and steaming). 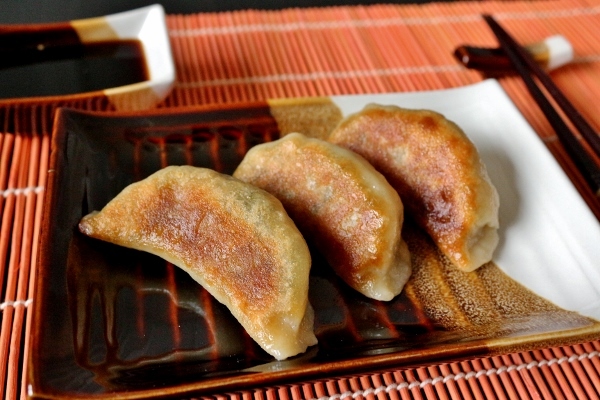 Although I love steamed dumplings, my favorites are pan-fried. 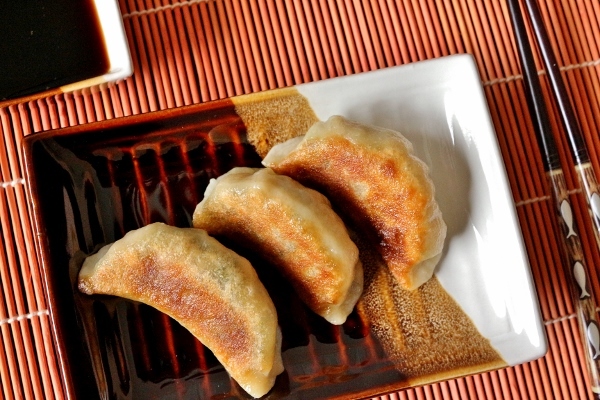 On the West coast they are often referred to as potstickers, but on the East coast, and namely New York City, they are called pan-fried dumplings. "Potstickers" are for tourists ;-) The crust on each dumpling was amazing! It was audibly crisp, like a potato chip, yet perfectly balanced by the chewiness of the rest of the dumpling skin. Her suggestion to serve them with the crust facing up (or technically to the side) is vital in retaining the crisp texture. I wanted to balance the meaty filling of the baked bao with something lighter and more vegetal, so this was an excellent pairing. 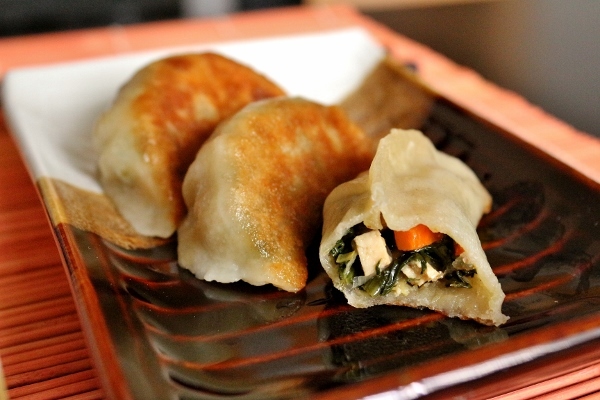 These vegetable dumplings are vegan and full of flavor! Spinach, shiitake mushrooms, carrots, and pressed tofu (I found a small variety at Whole Foods) make up the bulk of the filling. You definitely don't miss the meat at all! I froze half of these dumplings for future enjoyment, and I highly suggest you do too, or if you plan on serving them all at once, double the recipe and freeze a whole batch. It will be easier to make twice as much now than making it two separate times later on. 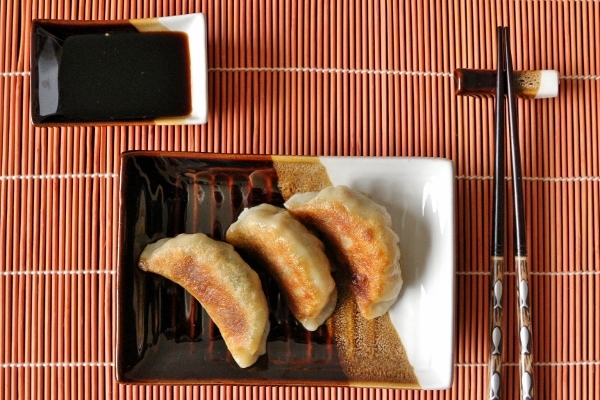 When a dumpling craving hits, there is nothing better than a homemade dumpling on the fly to really satisfy. Check back later this week for more of my Dim Sum and Then Some series when I share an incredibly easy and delicious recipe for scallion pancakes from another dim sum cookbook I own and love, as well as a flaky and delightful char siu pastry recipe! *Update 1/18/15* I uploaded new photos for the pan-fried vegetable dumplings (the baked char siu bao photos are still the originals). To make the filling, soak the dried mushrooms in a bowl with room temperature water to cover for 8 hours to overnight. This slow soaking will result in the best texture and flavor. Remove the mushrooms from their liquid, cut off the tough stems, and finely chop the caps, resulting in about 1/2 cup chopped mushroom. Reserve 1/4 cup of the mushroom soaking liquid (pass through a cheeesecloth-lined strainer to remove any sand or grit). Put the spinach in a large bowl and cover with boiling water. Let spinach wilt for about 30 seconds, drain, rinse with cold water, and drain again. Squeeze spinach with your hands over the sink to remove excess moisture. You should have about 1/2 cup firmly packed spinach. In a bowl, making the flavoring sauce by combining the reserved 1/4 cup mushroom soaking liquid, salt, pepper, sugar, soy sauce, and sesame oil. Stir to dissolve sugar and set aside. In a wok or large skillet, heat the canola oil over medium heat. Add the ginger and stir-fry for about 30 seconds until aromatic. 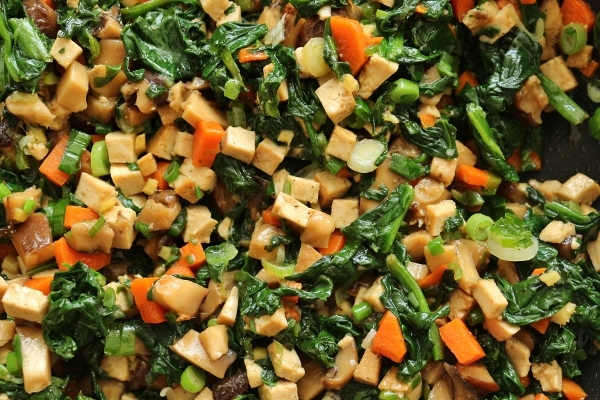 Add the spinach, carrot, mushrooms, and pressed tofu. Stir to combine and then pour in the flavoring sauce. Cook for 2 minutes until the vegetables release their juices a bit, give the cornstarch mixture a final stir and add it to the filling. Stir to thicken, remove from the heat and add the Chinese chives. Transfer to a bowl and cool completely before assembling dumplings. You will have about 2 cups filling. The filling can be prepared 1 day in advance and refrigerated. Bring to room temperature before assembling dumplings. 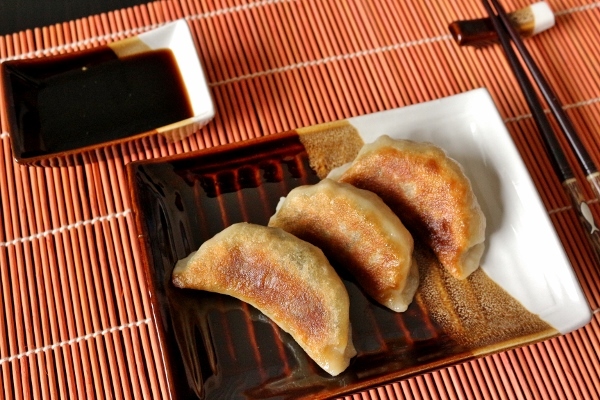 To assemble the dumplings, remove the dough from the bag, turning the bag inside out if the dough is sticky. Put the dough on a lightly floured surface and cut it in half. Put half back in the bag, squeezing out the air and sealing it closed to prevent drying. 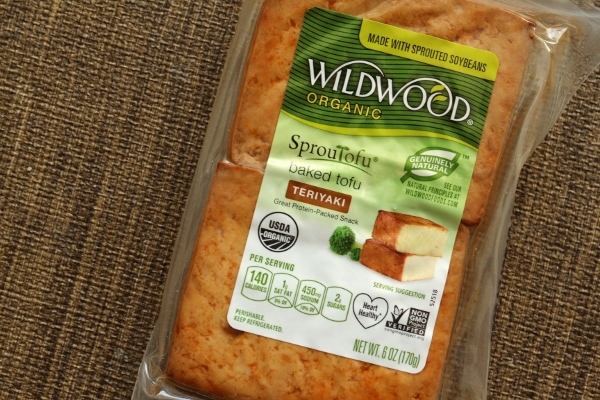 Roll the dough into a 1-inch-thick log and cut into 16 pieces (cut in half, then cut each half in half, and so on to create pieces that are even in size. The tapered end pieces should be cut slightly larger). If your pieces are oval, stand them on one of the cut ends and gently squeeze with your fingers to make them round, like a scallop. Take each piece of dough and press each cut end in flour, lightly pressing the dough to about 1/4 inch thick and set aside. Next, flatten each dough disk into a thin circle, about 1/8 inch thick, either with a tortilla press (lined with plastic wrap), or with a heavy flat-bottomed object like a frying pan (also lined with plastic). Alternatively, I used a dowel (which is a good lightweight rolling pin alternative for fast and flexible dumpling making) to lightly roll out each disc into an 1/8 inch thick circle. To finish the wrappers, place wrappers one at a time on your work surface, and flour only if sticky. Imagine a quarter-size circle in the center of the dough. This is what the Chinese call the "belly" of the wrapper. 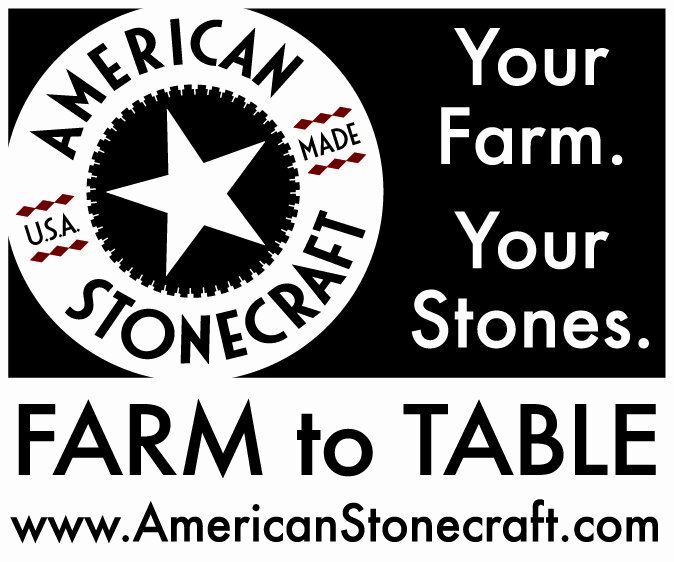 You want to create a wrapper that is larger than its current size, but still retaining a thick "belly" in the center. This ensures an even distribution of dough when the dumpling is sealed. Use the rolling pin to apply pressure to the outer 1/2-to-3/4-inch border of the wrapper. Roll the rolling pin in short downward strokes with one hand while the other hand turns the wrapper in the opposite direction. Aim for wrappers that are about 3 1/4 inches in diameter. When a batch of wrappers is formed, fill them before making wrappers out of the other portion of dough. To make "pea pod" shapes, fold the edge of the wrapper closest to you to meet the top edge and pinch together to seal well. Place on your work surface and press gently to steady the dumpling and make it sit flat. Fold the sealed edges of the dumpling to make a series of pleats from one end to the other. Place finished dumplings on the prepared baking sheet. Repeat with the remaining wrappers and dough, spacing out dumplings about 1/2 inch apart. Keep the finished dumplings covered with a dry kitchen towel. Serve with the dipping sauce in a communal bowl or in individual dipping sauce dishes. Enjoy!